"I love pizza, but I can no longer eat yeast bread. I can have wheat though, so pasta is still in. To serve my pizza craving, I devised this dish that delivers all the goodness of a supreme combo pizza without the yeast bread. For a crowd, serve with garlic bread and salad and/or veggies on the side to really stretch this dish." Heat spaghetti sauce in a saucepan over medium heat. Cook and stir sausage and water in a large skillet over medium heat, using a potato masher to break sausage into small pieces, until sausage is crumbly and almost cooked through, about 5 minutes. Add pepper and onion; cook and stir until onion is tender, 5 to 10 minutes. Stir cottage cheese, eggs, Parmesan cheese, and parsley together in a bowl. Spread about 1 cup warmed spaghetti sauce into the bottom of the prepared baking dish. Arrange 3 lasagna noodles over the sauce. Spread 1/2 of the cottage cheese mixture over the noodles, another 1 cup spaghetti sauce over the cheese, and 2/3 cup sausage mixture over the top. Sprinkle 1/2 of the pepperoni pieces, 1/2 of the sliced mushrooms, and 1/2 of the olives over the sausage mixture. Scatter 1/3 the mozzarella cheese over the top and arrange 3 lasagna noodles atop the cheese. Repeat layering again. Pour remaining spaghetti sauce over the lasagna and sprinkle remaining mozzarella cheese over the top. Cover baking dish with aluminum foil. Bake in the preheated oven until sauce is bubbling around the edges, about 25 minutes. Remove aluminum foil and continue baking until cheese is melted and golden, about 5 minutes more. Cool for 15 minutes before slicing. Ricotta cheese is, of course, traditional in lasagna and may be substituted for cottage cheese. I always have good luck with cottage cheese and it is more budget friendly. Meat sauce can also be used in place of marinara if you prefer. 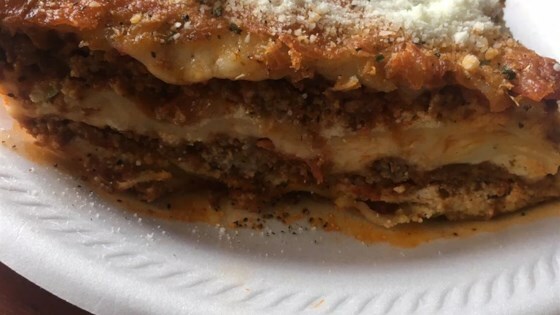 You can also use traditional lasagna. Follow package directions to cook and prepare it before using in this recipe.